To your bentos for the sushi contest! The one who eats the most sushi of the same kind wins the points. The one who eats the most varied food is entitled to dessert... 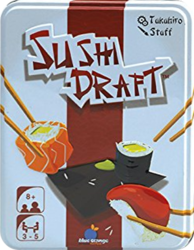 Your objective: eat as much sushi and as much variety as possible to earn points AND dessert! Contents of the box : 8 Sushi Tuna cards, 7 California Shrimp cards, 6 Rolls Salmon cards, 5 Maki Cucumber cards, 4 Temaki Mackerel cards, 2 Joker cards, 18 Victory Point chips.